Once upon a time, a few weeks ago, I saw a thing of wonder on my Facebook feed. All authors know of this treasure - the submission request. Yea, though I saw the submission request, and it was for... HORROR! 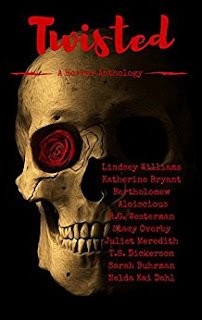 A horror anthology by and about women... Hey, I can do that! So I looked through my WIPs (works-in-progress) and my ideas spreadsheet (oh, yes, I do), and I found the perfect thing. Coming out on Halloween, "Mirror, Mirror" in Twisted: A Horror Anthology! 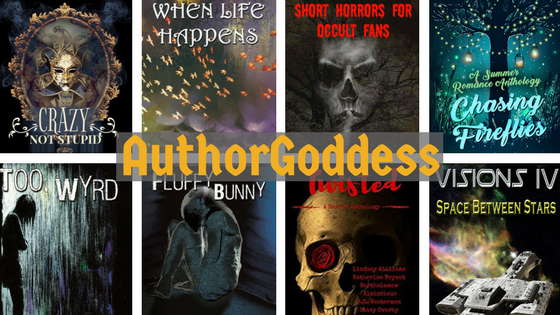 I am participating in a blog hop type of thing with the other authors involved in this anthology to spread the interviews far and wide. So check out the interview below, as well as the other interview posts! Short Bio: T.S. is living a dream one day at a time. She loves blogging and reviewing books. She enjoys participating in the Collaborative Writing Challenge's projects and is the Story Coordinator for their sixth novel. She is currently finishing up her first full length novel which is to be released in February. Name of Story Included in Twisted: "Initiations"
Describe the mood of your story/stories: Unsettling. I think my character is sort of darkly, deliciously ambitious and that colors the story as well. Where did you get the inspiration for this piece? It was actually born from a prompt for a writing competition in an online writer's group. What is your favorite thing about writing horror? Giving a nod to the darkness that exists within us all and coming face to face with the grim corners of my own brain in the process. What are you working on now? Finishing up my post-apoc romance (The Scarring Underneath), CWC projects, and two projects that deal with hauntings. Other published works? I had three chapters accepted into CWC's The Map. And The Scarring Underneath will be released in February, but nothing is available quite yet. Check out my blog at www.tsdickerson.com or catch me on Facebook or Twitter for updates! Short Bio: Stacy Overby works as a substance abuse counselor for teenage boys by day and as a writer by night. Her day job provides inspiration for a number of her stories, including her short stories â€œThe Trial of Summerâ€ and â€œKarma Incarnateâ€ releasing in October 2016. When not at work or writing, she is playing with her son, hiking, camping, or involved in other outdoor activities â€“ as long as it is not too cold. Where did you get the inspiration for this piece? Honestly, there were a number of things that came together to create this story. I work with teenagers who have experienced significant trauma. While I have to remain professional at work, inside there have been numerous times I wanted to go out and do evil things to the people who victimized my clients. Another little piece is that I love fantasy and mythology stories, so the idea of abstract concepts, such as karma, being something tangible is pretty appealing to me. Plus, there's magic. Magic is always cool. So, when I set out to write a strong female protagonist's story, it all came together to create Karma Incarnate. Along with a little dose of research to flesh out a few of the concepts. What is your favorite thing about writing horror? I love messing with people on a psychological level. That opportunity to get people to look under their beds and over their shoulders is fun. And I enjoy doing it in a way that lets people who struggle with blood and gore have some fun, too. What are you working on now? Wow. That's an excellent question. I have a number of projects in the works. Being rather ADHD, I struggle to focus on just one. The two big projects I'm trying to focus on are a futuristic sci-fi novel and an epic fantasy novel. I'm hoping to start querying my futuristic sci-fi novel early next year for publication later next year. Other published works? I have a short story called "The Trial of Summer" coming out in an anthology called Tales from Our Write Side. Unfortunately no links yet, but keep an eye on Amazon as it is being released October 2016. Short Bio: Katherine Bryant is an author and artist hailing from Minnesota. When she is not busy writing tales of mayhem and adventure or creating miniature monstrosities from wool, she spends her time tending her menagerie and playing too many video games for her own good. As with most humans, you can find Katherine on Facebook and Twitter, as well as her website. Names of Stories Included in Twisted: "Taste So Good" and "Progress"
Describe the mood of your story/stories: "Taste" is both seductive and gory. "Progress" has a vibe that could be summed up as decay. Where did you get the inspiration for this piece? "Taste" started out as practice for writing kissing scenes... but I was in a really bad mood when I wrote it, so it turned into its own monster. "Progress" came from a writing prompt. What is your favorite thing about writing horror? I like being able to tap into that messed up part of myself and express it in a way that won't get me burned at the stake. Also, freaking people out is fun. My sweetie wouldn't let me kiss him for a week after he read "Taste So Good." What are you working on now? Book two of my fantasy novella series "Branna's Song" and a currently untitled urban fantasy novel. Other published works? "Branna's Song: The ColdwoodSaga" is available for pre-order on Amazon. Short Bio: R.G. Westerman is a Self-Published Indie Author who previously worked full time as a ghostwriter. She decided she was tired of writing for everyone else and turned hands to keyboard for her own stories. Currently, she lives in Tennessee with her gorgeous husband and two genius children. Her monthly newsletter can be accessed here, and she runs a book marketing blog here. Describe the mood of your story/stories: I like try to write stories which touch on the human condition in some way. At the end of the day we all fear something. I like to poke those fears with a stick and flip the rock over to see what is there. Where did you get the inspiration for this piece? From a dream I had as a child. What is your favorite thing about writing horror? For my short stories, I don't think I sit down with the sole intention of writing horror. I write the stories, and sometimes they end up being horror. That being said, I like a monster more than any human bad guy ever. Monsters are easy. Monsters are manageable. That's probably why I gravitate towards horror. What are you working on now? Currently, I am finishing up the final episode of the Rising Ash Saga, Thorn, which will be available soon on Amazon. I am looking forward to NanoWrimo coming up this November. I can't say what genre I'm writing this time around, but it rhymes with bleampunk. Other published works? The Rising Ash Saga - Ash, Blaze, Eden, and Rose. Short Bio: Writing stories long before I could spell, I first received formal commendation for my writing in the 8th grade ('92/'93) when my student writing portfolio received the highest rating (distinguished) given under the 1990 Kentucky Education Reform Act. Three years later, I auditioned successfully in creative writing to attend the 1996 Kentucky Governor's School for the Arts. This three-week program, considered a flagship of its type in the nation, seeded a love for my generation's voice and an understanding of the art of giving and receiving constructive criticism. I earned my B.A. in English in 2001 from Transylvania University in Lexington, KY. Four years later, I began adding to my studies in creative writing through MFA-led community classes at what would later become The Muse Writing Center in Norfolk, Virginia. Through moving to Oregon in 2006 and becoming a parent, I've continued my writing in poetry, fiction and non-fiction. Freeze Burned is my first short story to be included in an anthology and the first of my writing to be widely published in any way. Describe the mood of your story/stories: Readers will feel the enormity of what has already happened to the main character Icy within the first few paragraphs of the story. The most physically painful and psychologically scarring parts of her life lay behind her, but the character we meet still has intense "after shocks" to deal with. I chose her nickname ""Icy"" for a number of reasons, not the least of which, I felt it worked well with a story that bombards the senses with suggestions of physical coldness. And for readers who manage to avoid getting sympathy chills, they're sure to still break out in goosebumps more than once while weathering the twists and turns of this short psychological thriller." Where did you get the inspiration for this piece? I took the NYCMidnight Short Story Challenge in early 2016 and received the following prompt in round two of the competition: Genre - Horror, Character - Smuggler, Plot Point - A Confession. As I drifted off to sleep thinking about what I needed to weave together, Icy's story came to me. What is your favorite thing about writing horror? Oddly enough, "Freeze Burned" represents my first foray into the genre. Up into my late 20's, I remained very susceptible to excessive fear and even sleep disturbances in response to exposure to horror movies. I shunned the genre in every medium. When I received the challenge from NYCMidnight to face this fear of my own, I found the process incredibly cathartic. It also bonded me to my character as she and I were both facing a fear we'd promised ourselves we'd never venture back to. Now that I've tried it once, I can't imagine not writing more in this genre. What are you working on now? I have 18 novels I've started writing and none finished. I am currently taking part in the NYCMidnight Flash Fiction challenge, and after completing the second short short for it, I found I had much more of that particular tale (a fantasy) to tell, so in the immediate future, I'll be finishing, editing and workshopping another short story I imagine will fall right in the 4K-word range. November is National Novel Writing Month and I have a tough choice on my hands as to which of my 18 novel starts I'd like to try to finish. Other published works? Freeze Burned is the first of my creative writing to be widely published. Short Bio: Lindsey is a Jane-of-all-trades sort who is passionate about a variety of social issues. When she's not writing, she's been known to engage in numerous forms of self-torture such as participating in debates or translating things into ancient Egyptian. Some of her other hobbies include researching and/or analyzing pretty much everything to death, conducting culinary experiments, listening to really loud heavy metal while relaxing in her pool, and illeism. What is your favorite thing about writing horror? I love writing horror because there are less boundaries, less rules. There is more of an expectation the material is going to be shocking or disturbing, so you can really step outside 'norms' and really explore. What are you working on now? I'm currently trying to meet my December deadline for my series book two, Livelihood. On top of that I'm also working on 3 other shorts and a sci-fi story, Astralis, which I'm doing as a serial for free on Wattpad (LindseyWilliams83). Other published works? The only other work I have published that's not being collected in this anthology is Motherhood, a sci-fihorror/thriller.